Sherry FitzGerald is offering to the market No 8 Manor Close, Kingston. Kingston is a much sought after area in Galway city, located next to Taylor’s Hill and within minutes’ walk of the Salthill Promenade. This popular area is within a short drive of Galway city centre where all amenities are at hand, while within the immediate vicinity you benefit from having an abundance of sporting and recreational activities including sailing, golf, tennis, and the local GAA club. No 8 Manor Court is a fine detached home which was built in the 1970s and benefits from having a large site with ample space to the side suitable for extension (subject to planning permission ). Internally this two storey family home requires some modernisation but offers marvellous potential in the right hands. Size is 136.6sq m (1,470sq ft ) approximately. Internally this home has been well maintained and cared for by its current owners. There are two large reception rooms on the ground floor, together with separate kitchen, utility, wc, office/bedroom, and solid fuel storage room. Upstairs there are four bedrooms and a main bathroom. The gardens are mature with established evergreen trees to the back and well defined boundaries which offer privacy and good space to enjoy your outdoor environment. TheBERisE1onBERcertno 106247729, with an energy performance indicator of 330.51 kWh/sq m/yr. This truly is a lovely family home with spacious accommodation and modern comforts, offering maturity and scope to extend. Must be seen to be appreciated. 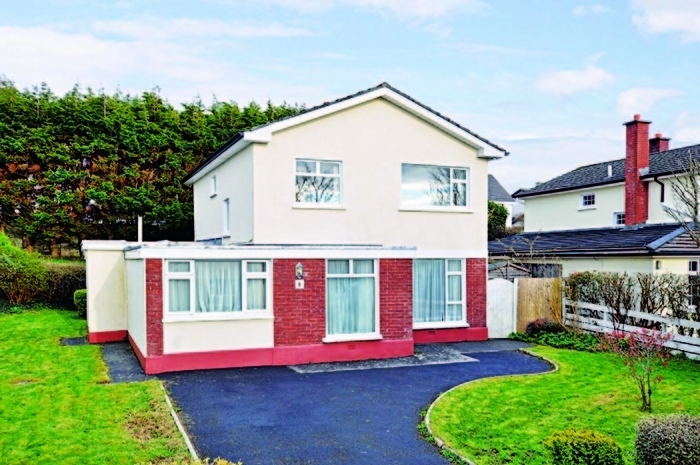 Asking price is €445,000 and viewing is recommended.